My cousin has the same hair style. I’m not kidding. When I was in school, we had a fairly strict dress code in school. No logos, solid color polo shirts and blue, black, or khaki/tan/brown slacks, and hair on men that didn’t touch ears, eyebrows, or shirt collars. Also, the only facial hair allowed were creepy mustaches or sideburns to the earlobe. The moment I graduated, I started growing my hair out and grew a beard that has lasted, more or less, since 1999. I can count on one hand the number of times I’ve been clean shaven, and I don’t intend on going that way again any time soon, so I sympathize with teenager Caycee Cunningham. She wants to be different and to express herself within the rules of her school, and she’s running into trouble due to her race. 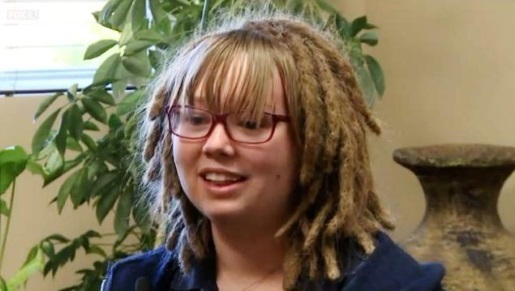 A teenage girl from Pleasant Grove, Utah, says she’s being discriminated against due to her white girl dreadlocks. According to Cunningham and her mother, Tonya Judd, plenty of other students of non-white backgrounds have hair that cannot be combed, possibly bringing them afoul of Lincoln Academy’s dress code and hair guidelines. Principal Jake Hunt maintains that while dreads aren’t on the banned list, distracting hair cuts are, and white girl dreads in Utah would probably be pretty distracting. Then again, most kids that age aren’t going to be distracted by someone else’s hair, provided they’re not smelling the joint up with their ratty unwashed locks, so… this one might be an issue for longer than it will take for Caycee to grow out of her Hinduism stage.